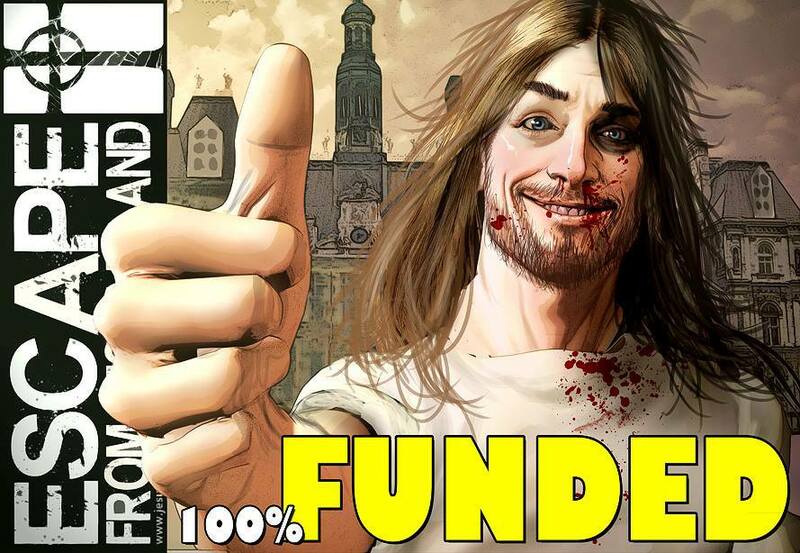 “The Escape From Jesus Island Kickstarter campaign raised $15,899, nearly doubling our initial goal! This will allow us to print the first six issues, as well as get an EFJI clothing line up and running. On behalf of the Escape From Jesus Island team (myself, illustrator Mortimer Glum, editor Shawn Greenleaf and letterist Peeter Parkker), thank you so much for your support during this past month. Thank you for giving us this opportunity. It’s been an incredibly stressful, but fascinating process, seeing which rewards most appealed to our fans. The signed and numbered Kickstarter-exclusive copies of Issue 1 with an alternate cover may be the steal of the campaign. 37 were claimed, plus one for each of the crew, so there will be 41 of these special issues in existence. Ever. Overwhelmingly, the reward that you folks most wanted was to appear in the comics. The first role was claimed less than a minute into the campaign. Only 12 of the 39 available roles remained when the dust settled last night. I love this aspect of the project so much. I love that our fans are a part of the story. That so many of the people who helped us in this critical early stage will be immortalized in Act One (Issues 1-8). Bridget McGraw, Daniel Brochs, Jason McCutcheon, Sean Savoy, CPJ van der Velden, Lawton Mann and the lucky person receiving this as a gift from user Spongefile will each die horrible deaths in Escape From Jesus Island. Each will appear as either a ReGen Corp employee or Vatican Black Ops agent who gets up close and personal with a mutant in a very bad way. Chris Lyford and Big Gore (from the metal band Coffin Syrup) will die at the hands of the Antichrist himself after claiming the Death By Damien reward. Cheryl Parisi and Kimberly Lynn Campbell will come face to face with the Unholy Abbess as our Death By Mother Superior backers. That is not going to end well for them. Charles Stephen Mineo will be torn apart by the seven-headed monster Pariah, played by fans Bryan Sinagra, Leo Beaucage, Dylan Gemmell, Juan Ayala, Jr., Jennifer Hagopian and Daniel Lovasz. Carlos Macera and John Plumley will get Hulk-smashed in brutal fashion for their Death By Goliath pledge. Jamar Green, Michael Estes and Jonathan White will be transformed into mutants who wreak a little havoc, and Charles Vorhees Krueger will be a featured mutant, the first ReGen test subject we meet up close and personal in Issue 1. Paul Coward will be Frankensteined together with a friend or loved one into a Combo Mutant which first appears in Issue 3. I love this reward so much. This creature makes a very memorable first appearance. Dave Rambo claimed The One Who Got Away, and will appear in our series as the Head of Security for ReGen Corp’s Malsum Island Research Facility, a badass mutant-wrangler with a knack for emerging from chaotic situations unscathed. And Steven N. Long will be a staple in this franchise, playing the Antichrist’s personal bodyguard, Inquisition. This is a tremendous role and you’ll be seeing a whole lot of Steven’s face (sans skin) in the pages of our comic and on our merchandise. We’ll also flash back to tell Inquisition’s story, showing him before he became so horrifically burnt. Steven’s son will also have a small, but kickass cameo in our early issues. Why settle for being a character in our story when you can have the Jesus Island team create something specifically for you? That was approach by Bud Wellington and Tim Stiles, who each claimed the Creator Reward. Our team will work with Bud on a non-fiction project and we’ll be creating a 12-page section for Tim for his upcoming comic Cthulhu Williams: Weird Tales. Again, thank you all so much. We have such big plans ahead and you’ve allowed us to take this giant first step. Back to work I go. This thing isn’t going to write itself.